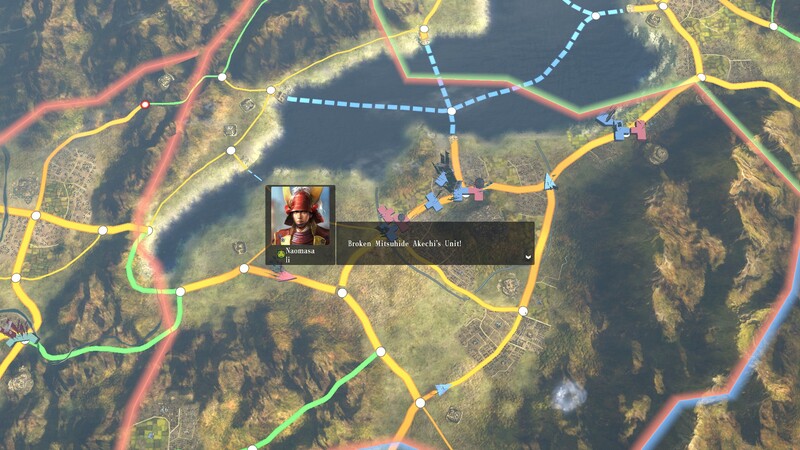 I love the alliance & coalition systems in Nobunaga’s Ambition: Sphere of Influence. They are elegant: while simple, they solve one of the main problems with alliances in strategy games. They’re also thematic! There are several interlinked mechanics. First, “trust” – the basic currency of diplomacy 2. Trust is accumulated by sending a diplomat and investing time and money. It is cashed in to obtain military assistance or sign an alliance — effectively a non-aggression pact, since military assistance can be rendered with or without a formal alliance. 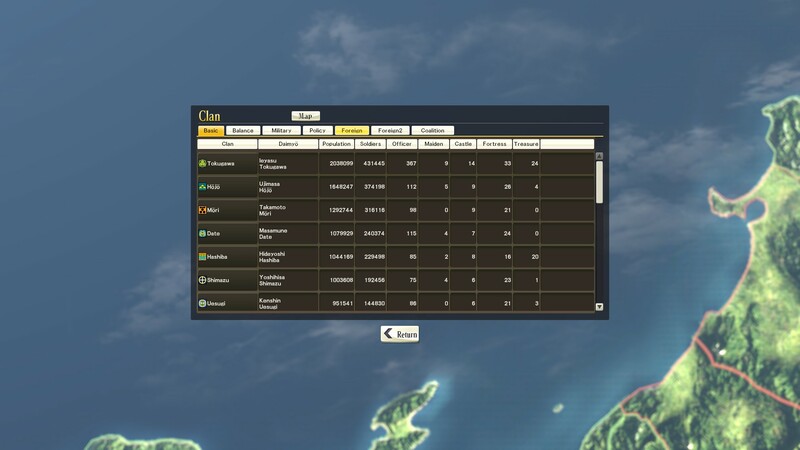 In either case, to obtain help, the player selects a target city within range of a friendly AI player, and cashes in the required trust points. 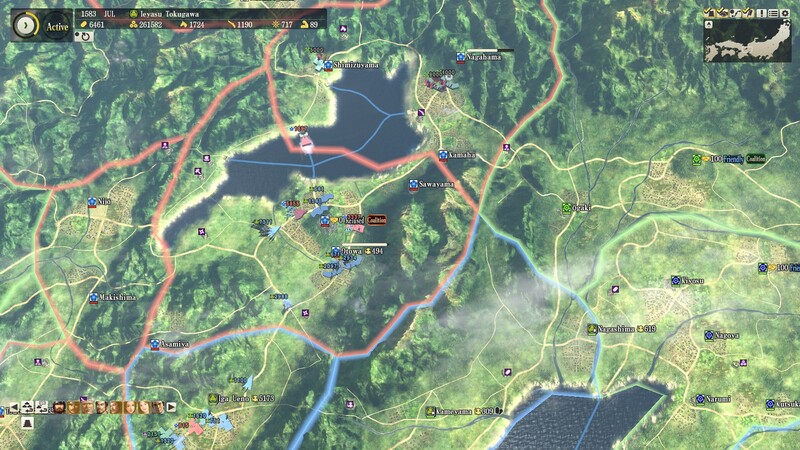 The AI troops will sortie immediately – either to attack, if it’s an enemy city, or help defend, if it’s a friendly city. There is a cooldown to prevent abuse, and between this and the need for trust to replenish, I try not to call on my AI friends unless I really need it. Sometimes the AI will ask me to return the favour, which will give me a reward in trust. There is a true alliance system in the form of coalitions. 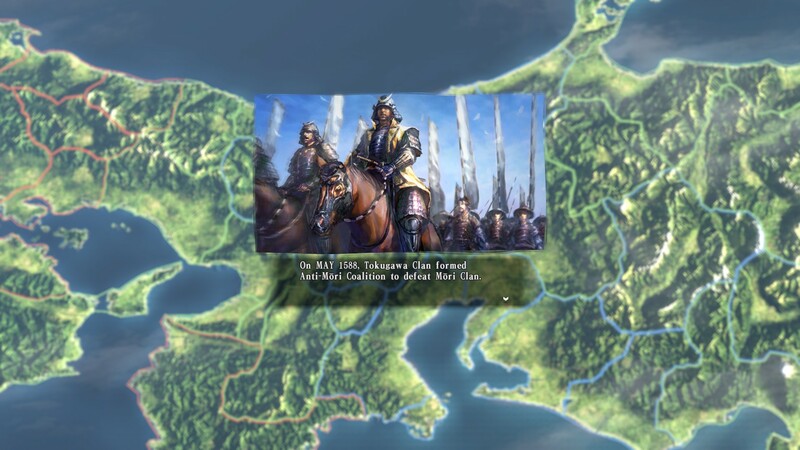 The coalition leader designates a target and invites several friendly clans to enlist – in my case, I designated Akechi Mitsuhide as the target, and called in Hideyoshi and the Oda remnants as my coalition partners. In turn, the coalition target can invite its own friends to join; Mitsuhide called in the Shimazu, Chosokabe, and Takeda against me. Incidentally, alliances are usually for a finite time3, and coalitions always are. The major advantage of this system is that it works. How many times have you cursed absent allies in single-player strategy games? Not here. If you’ve invested in trust, and if your allies are in range, their relief forces will be there. A second advantage is that while diplomatic reversals can feel frustrating and random in other games, they feel fairer in Nobunaga’s Ambition, a game that explicitly makes most alliances temporary. Indeed, the temporary, shifting alliances engender a sense of fluidity, a sense that if the diplomatic situation is unfavourable today, a better opportunity may come tomorrow. Finally, there is something really cool about seeing clans coalesce into Sekigahara-style blocs. At this stage, my main reservation is that4 it seems a bit easy to cheese the AI, once the player has adequate cash to spam diplomatic missions (and bribe the holdouts). For example, at one point, the Hojo asked me to sign a truce with the Takeda. As I had the Takeda on the ropes, I said no. The Hojo attitude flipped from “friendly” to “wary”… until I sent them another gift. And, when that wore off, another. I think I must be allied with half of Japan by now. Still, I can forgive a blemish in execution. 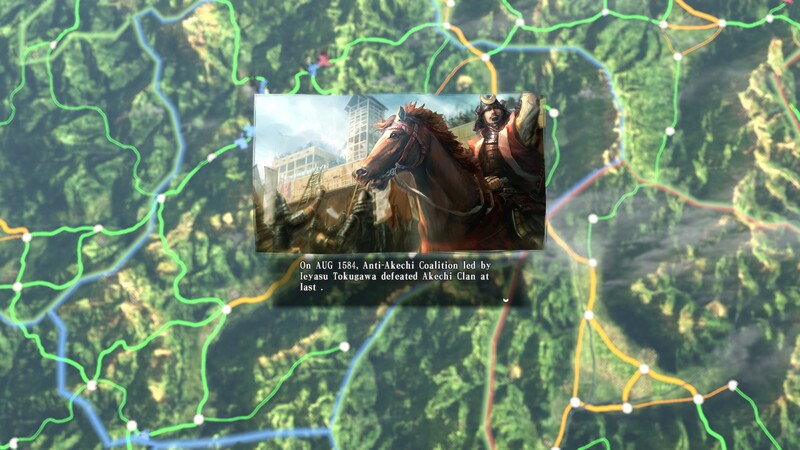 Nobunaga’s Ambition has one of the most interesting diplomacy/alliance systems I’ve seen – a microcosm of what has turned out to be one of the freshest, most interesting strategy games in years. This could just be my dark horse contender for Game of the Year. Stay tuned!